Big on charm with room to grow, this cozy country cottage with covered porch and dormers is the perfect plan to call home. Natural light from the clerestory dormer floods the foyer, while interior columns help define the dining room from great room. Nine foot ceilings give the first level a feeling of spaciousness not usually found in a house this size. A first level location gives the master suite privacy, while a whirlpool tub with skylight above, double lavs, and separate shower provide luxury to busy homeowners. 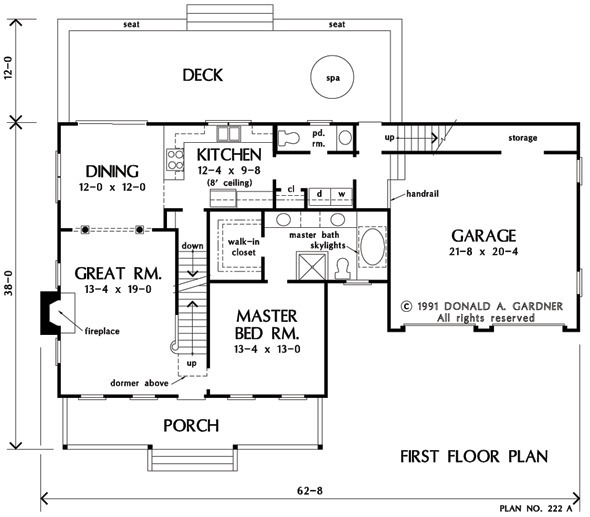 1st Floor: 1057 Sq. 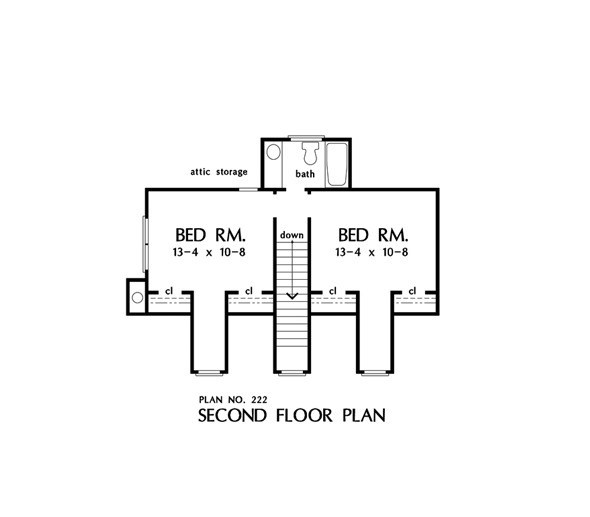 Ft.
2nd Floor: 500 Sq. Ft. 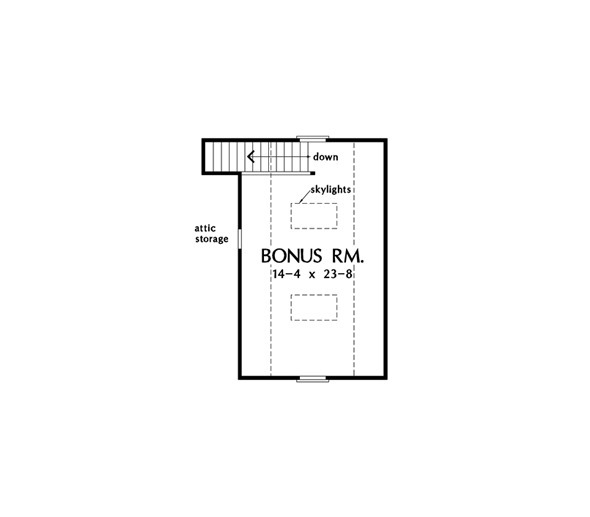 Bonus Room: 378 Sq. 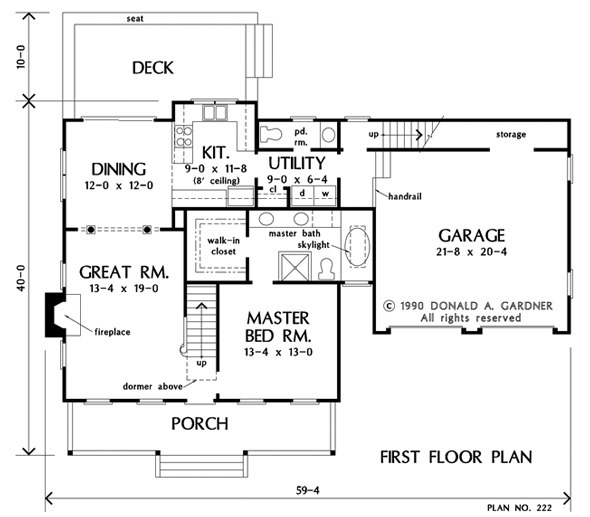 Ft.
House Dimensions: 59' 4" x 40' 0"
Great Room: 13' 4" x 19' 0"
Great Room : 13' 4" x 19' 0" x 9' 0"
Utility Room : 9' 0" x 6' 4" x 9' 0"
Garage Storage : 17' 8" x 3' 0" x 0' 0"
Bedroom #3 : 13' 4" x 10' 8" x 8' 0"
Porch - Front : 30' 2" x 6' 0" x 0' 0"